I have been coming to Wednesday Meeting at Westminster Quakers for just over 2 years. My spiritual life was something I had struggled with for a number of years before I started coming. I had been raised a Catholic, became an Anglican, ended up doing some Eastern meditation. What I increasingly was looking for was an accepting, supportive and questioning community where I could grow on my spiritual journey. I found myself drawn to the stillness of eastern meditation, but wanted to be part of a community. 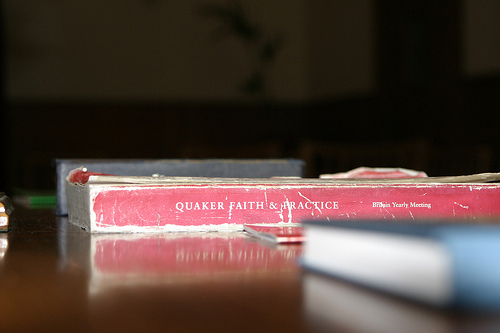 What drew me to Quaker meetings was its silent worship which wasn’t overly structured. What I have found in the quiet worship is a sense of fellowship in our own personal journeys. There is a sense of strength, support and stillness within in the quiet worship. It has helped me to listen deeply, not only to myself, but also to God and the world around me. I have become increasingly more connect to myself and those around me. The testimonies within the meeting have also served to raise insights and questions for me to work through. From the stillness of the meeting, I have found myself more sensitive to the world around me. As I listen more deeply, I find myself being more patience with myself and the world around me. Heather Martin delivered this ministry at Westminster Friends Meeting for Worship for Business on 08/05/2011.